We typically don’t plan elaborate summer parties—we prefer impromptu get-togethers with friends. Although I love to be in the kitchen, it’s not the most social place to be when your guests are hanging out on the deck. Plus, this girl doesn’t really relish the flushed sunburn glow that comes from kitchen heat in the summer, if you get me. When it comes to these get-togethers, I like to leave the main courses to the men and the grill. But I love to make easy, fresh side dish recipes that don’t require the use of an oven (or any other heat source, for that matter!). When faced with last minute entertaining, I always take a simple approach to food—dips, salads and no-bake desserts full of fresh summer produce. My go-to appetizer is homemade dill dip served with carrot and celery sticks and cherry tomatoes. Serving them up in individual shot glasses offers a little visual interest, and its grab-and-go portability makes them perfect for mingling. Finally, no party in this household is is complete without dessert. Last week, I had pineapple on hand, and I decided it would be absolutely divine folded into a simple no-bake bake dessert. A crunchy graham crust is layered with a cloud-like, pineapple-infused sweet cream cheese filling and finished with a dollop of fluffy whipped topping to create a five-star dessert in less than 10 minutes! In a medium bowl, whisk together the sugar, poppy seeds, onion, vinegars and oil. Cover and refrigerate until ready to use. 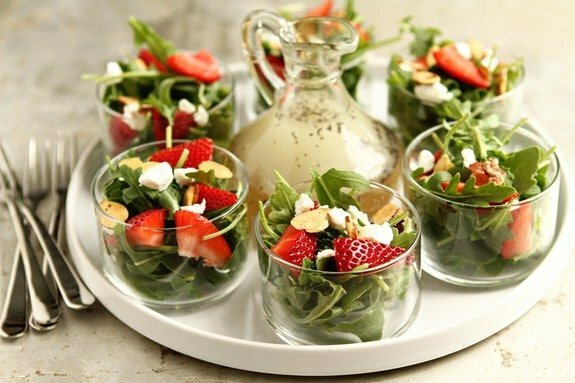 In a medium bowl, combine arugula, strawberries, goat cheese and almonds. Toss with desired amount of dressing to coat and serve immediately. In a medium bowl, stir together the graham cracker crumbs, sugar and melted butter. Evenly divide the crumbs between your individual serving dishes and press into the bottoms of the dishes to form a crust layer. In a large bowl, with an electric mixer, beat the cream cheese and sugar on medium-high speed until smooth and creamy, about 3 minutes. Add in pineapple and vanilla and mix to combine, scraping down the sides of the bowl as needed. Using a rubber spatula, fold in the whipped topping until well combined. Evenly pipe or spoon the filling into prepared individual serving dishes. Cover with plastic wrap and refrigerate for at least 3 hours before serving. 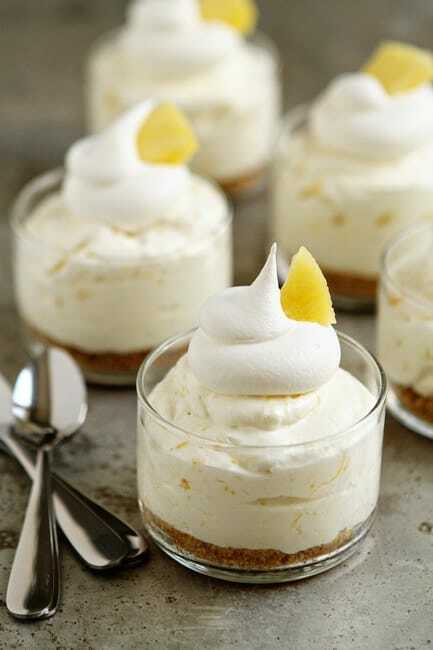 If desired, garnish with additional whipped topping and fresh pineapple. 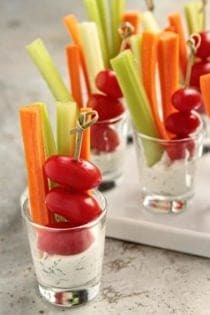 Serve with a variety of fresh vegetables or pumpernickel bread. The amount of sugar you need will depend on the sweetness of your pineapple. I recommend tasting and adjusting the level of sweetness before filling your serving dishes. This recipe was modified on 5/15/16 to included only canned pineapple. What are your favorite easy, no-cook side dishes for parties at your house? Share your ideas in the comments below. Hi! 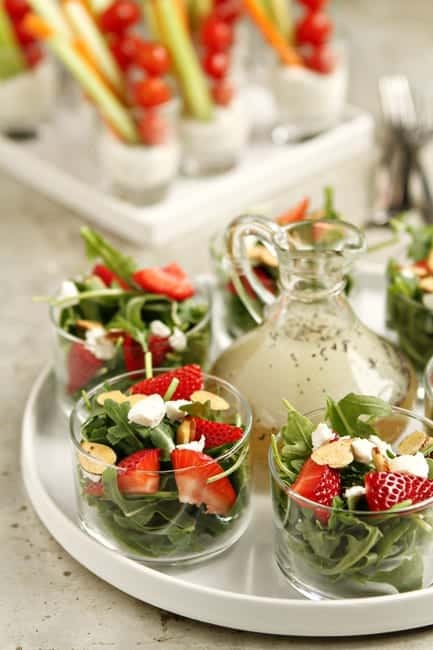 How many servings are in your strawberry salad recipe? Hi, Grace! I would say there are about six servings in the recipe. I hope you enjoy it! Wow I just made the cheese cake filling to top a pineapple cake. It is so tasty, light and refreshing! Thanks for the recipe! Yay! So happy to hear you enjoyed the recipe, Olga! Thanks so much for stopping by and leaving your feedback. Happy Baking!